Magical energy radiates from this energy-pulsing Arkansas rock crystal cluster - and rainbows, too! 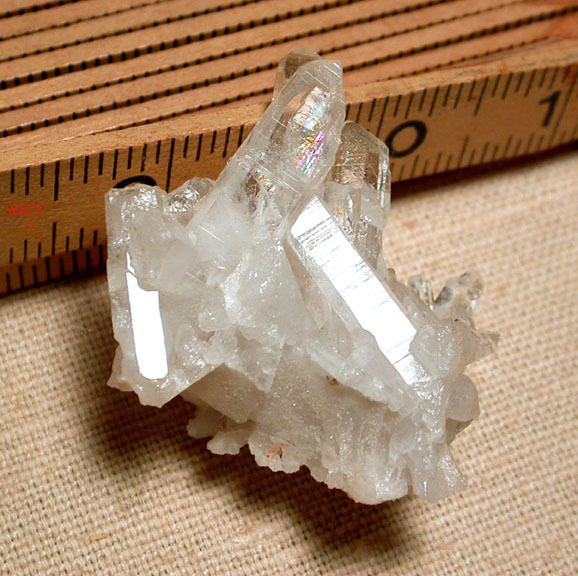 Minature size at 1-1/8x 1-7/8x 2" tall, its' clear crystals extend out from a neatly geometric sparkly milky base with crannies left from once-present calcite. The tallest, center crystal has an uncommon 8-edged grounding channel face, to support and clarify messages you might send. Much regrowth and one conchoid enhance the neat coral like look of the base reaching clarity.